We bought some nursery furniture about 6 years ago. We're having a second and child and are going to use the same furniture we used for out first. The problem is, there's a few bit marks that I'd like to repair if I can. My plan is to lightly sand the damaged area and apply a finish, but I have no idea what type of finish might have been used, whether it's a spray finish, or an oil. 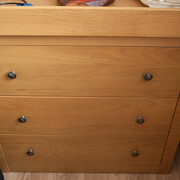 Here's a picture of one item of the furniture. I've tried my best to get a decent picture, but the wood always kept coming out looking like a white oak rather than the yellow colour the furniture is. I've added some warmth to the picture above in an attempt to replicate the colour. I have little experience with wood, but I'm thinking it's a light/medium oak finish. welcome to the forum. If, as it would appear, this is a piece of commercially bought furniture rather than bespoke, it will almost certainly have a sprayed lacquer finish which will be difficult to repair. You could try waxing it with something like briwax and seeing what it comes up like.